Buddhist retreats are a wonderful way to deepen your meditation practice. By finding time away from the distraction of everyday life you can make time for intensive practice. Dechen centres across the UK organise day, weekend and long weekend retreats throughout the year. Sign up to our news feed to keep updated. 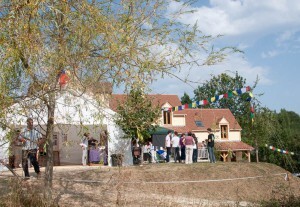 Dechen’s European retreat centre, Sakya Changlochen Ling, lies in the heart of Perigord Noir in the Dordogne region of France. It was founded in 1990 and named by Karma Thinley Rinpoche after the pure land of the bodhisattva Vajrapani. In this beautiful setting Lama Jampa Thaye gives teachings and leads meditation retreats from the Sakya tradition of Tibetan Buddhism. These events take place during the summer with additional individual and group retreats at other times of the year. Since 1990, Lama Jampa has run a college of studies (shedra) and series of Buddhist retreats at Changlochen to enable students to learn and practise in more depth, the teachings from the Sakya tradition. Usually held in the last two weeks of August each year, the retreats enable those students who have perhaps taken refuge, developed some practice in meditation, and received the preliminary teachings, such as The Four Thoughts that Turn the Mind to Dharma and Parting from the Four Attachments, to take things a little further and study some of the main texts from the Sakya curriculum, and to receive initiations that enable them to learn the meditation practices of the vajrayana. Lama Jampa has always emphasised that the Buddhist retreat centre of Changlochen is a place where the teachings of the Sakya school are transmitted, studied and practised, and for this reason the visits from the heads of the Sakya tradition have been landmark events. In July 2014 His Holiness the 41st Sakya Trizin visited the Centre for the first time and during the visit consecrated the buildings and land and bestowed the initiation of Manjushri, this made a profound connection between the Centre and a living throne holder from the Dolma Palace in Sakya, Western Tibet. As Lama Jampa has said: “Now the Sakya tradition under the compassionate guidance of His Holiness the 41st Sakya Trizin (b.1945), magnificent incarnation of the Khon line, is putting down roots outside Tibet in India, South-East Asia, North America and Europe.” June 2017 saw the historic first visit of the new head of the Sakya tradition the 42nd Sakya Trizin, His Holiness Ratna Vajra Rinpoche. During the visit, His Holiness blessed the Centre and the land, and approved the site for an enlightenment stupa to be constructed in the future. He also bestowed the Vajrakilaya Torma initiation of the Khon family lineage.